We specialise in buying in fleece from local farms. We then wash, dry, card and spin the fleece before knitting the wool into garments. For 3 years we have been buying local fleece. We then wash them by hand and dry them in the garden. 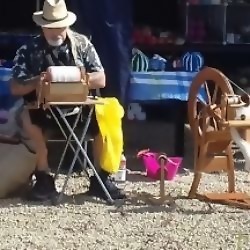 Nick then cards the fleece ready for Allie to spin at her wheel. The spun wool is then knitted by Allie into garments. These then go to Shelley for labels and buttons to be attached. The garment is then ready for sale. The Naked Sheep are proud to be part of the Made in Cornwall Scheme which is run by Cornwall Councils Trading Standards Department. It verifies that all our products are Made in Cornwall and as such are proud to carry their official label on all our products. We are also members of The Campaign for Wool.